I will soon be in Helsinki for the Open Knowledge Festival to give a keynote lecture. The subjects will be citizen engagement, participatory budgeting and technology. This talk will be on the topic stream “Open Democracy and Citizen Movements”. The Open Democracy and Citizen Movements stream explores the recent moves towards a more open and participatory democracy and society. Online tools allow people to speak, be heard, find each other and take collective action in new ways. The stream will showcase and debate the topic starting with the formal means of the new democracy as for instance, the crowdsourced Icelandic constitutional reform, participatory budgeting and European citizens’ initiatives. The theme carries on to to the informal, non-mandated citizen movements that are shaping our societies from the bottom up. This paper takes issue with the question of scaling up deliberation in connection to that of enlarged participation. Its aim is to argue that deliberation can be feasible and effective in wide participatory experiments, and therefore it can scale up to the national level and affect public decisions once the appropriate institutional design is in place. I propose feasibility and effectiveness as two overlapping dimensions of scaling-up deliberation. As for the feasibility dimension, I will argue that the institutional design of large participatory experiments should allow the kind of deliberation found in minipublics to scale up accordingly to three criteria: space, volume and actors. As for the effectiveness dimension, I will argue that large participatory experiments should provide that the deliberation process follows the criteria of transformation and impact in order to scale-up local preferences to the national level and make sure they affect policymaking. Such theoretical framework will be tested against the empirical background provided by the world’s largest participatory experiment known to date, the National Public Policy Conferences in Brazil. For a while, the (quite impressive) number of Ushahidi deployments has been repeated in development circles as proof of its scalability, although very little was known about these various deployments. A new report by Internews sheds light on a number of issues on that front, such as number of participants, areas of intervention and geographical coverage. 93% of Crowdmaps had fewer than 10 reports. 61% of Crowdmaps had absolutely no customization at all, i.e., they still had the four default categories and the default report. 89% of Crowdmaps had four categories, including those with the four default categories. 13% of Crowdmaps had 5-10 categories. 94% of Crowdmaps had only one user. (…) while about 61% percent exhibited virtually no activity beyond installation, 93% of Crowdmap instances reported fewer than 10 reports. In short, the power law distribution was far steeper than the Pareto Principle would anticipate. Our initial processing shows a vast majority of deployments with little to no actionable data with a slight slope toward the minority with a likelihood of effective and active engagement. The more reports a Crowdmap project has, the more reports it seems to attract, leading it to a positive feedback loop. In physics, power law relationships often reflect phase transitions. It is possible that there is an analogous process by which a map project reaches critical mass. If confirmed, this may indicate the importance of strategies to get nascent map projects “over the hump.” This is a promising area for future research. (…) more attention was given to analyzing the 585 Crowdmaps that had between 21 and 10,000 reports. An even more important question refers to the number of outputs (Crowdmaps created) and outcomes (impact). The report does not go that far. But still, it is a milestone in the efforts to better understand ICT mediated reporting (or engagement), a field in which policy is rarely backed by good evidence. 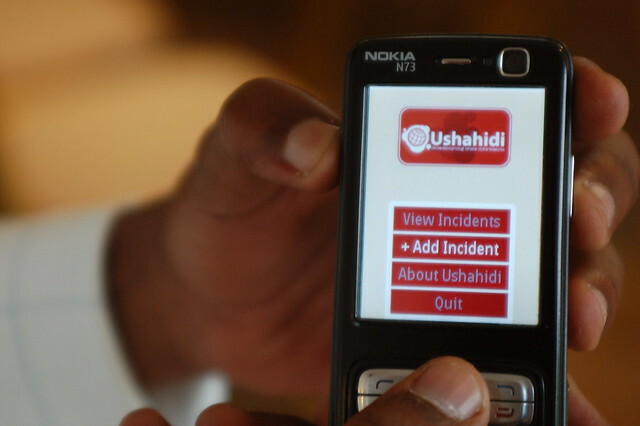 Even if these results might come across as disappointing to some, kudos should go to the Ushahidi team for sharing their data for an external evaluation. Having said this, and in the spirit of openness, provided security measures were in place, it would be great if this data could be made available to other researchers to conduct their own analysis. I just came across the proceedings of the Conference for e-Democracy and Open Government 2012 [PDF]. Arthur Lupia’s essay “Can Evolving Communication Technologies Increase Civic Competence?” [PDF] makes for great reading. It was also excellent to see Emmy Mbera’s paper about the experience of our program (ICT4Gov) in the Democratic Republic of Congo, “Towards budget transparency and improvement in the South Kivu Province” [PDF]. Emmy was one of the external evaluators of our mobile participatory budgeting project in South Kivu. In his paper, among other things, Emmy presents some of his preliminary findings with regard to increases in tax collection following the implementation of our project. In total there are 30 papers, some of which might interest researchers and practitioners in the field. Enjoy. Does democracy improve the quality of life for its citizens? Scholars have long assumed that it does, but recent research has called this orthodoxy into question. This article reviews this body of work, develops a series of causal pathways through which democracy might improve social welfare, and tests two hypotheses: (a) that a country’s level of democracy in a given year affects its level of human development and (b) that its stock of democracy over the past century affects its level of human development. Using infant mortality rates as a core measure of human development, we conduct a series of time-series—cross-national statistical tests of these two hypotheses. We ﬁnd only slight evidence for the ﬁrst proposition, but substantial support for the second. Thus, we argue that the best way to think about the relationship between democracy and development is as a time-dependent, historical phenomenon. The practical implications of this argument introduce grounds for both optimism and caution with respect to the ability of developing countries to improve their levels of human development. Realistically, countries should not expect large immediate dividends in human development to result from democratic transitions. On the other hand, given sufﬁcient time, democracy should begin to yield important, tangible beneﬁts to the underprivileged in society. In a world characterized by chronically short time horizons, the substantial political challenge is to allow democratic institutions the time necessary to realize these persistent but distal beneﬁts. Such a cautious note should also resonate with some open government advocates who tend to overestimate the effects of reforms in the short term while neglecting long-term perspectives. As I’ve mentioned before, my PhD research is concerned withlocal government and paticipatory initiatives. ‘Participatory initiatives’ meaning the citizens’ panels, area forums, participatory budgeting projects etc etc that aim to give the public someinfluence in the local policy process. One of the conceptual issues I face is tying down the precise characteristics of these participatory initiatives as they are all so different and are inevitably implemented in different ways. For a broad typology I draw on Graham Smith’s excellent Power Beyond the Ballot: 57 Democratic Innovations from Around the World – a report he produced for the Power Inquiry. You can download it here. Almost anything that starts with Graham Smith’s work is on the right track. Beyond the Ballot is great reading. Read the full post at the Localopolis Blog.